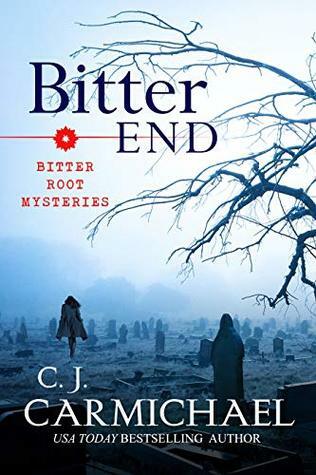 Bitter End by C. J. Carmichael is the third book of the Bitter Root Mysteries series. Each book in the series is centered around a new mystery so they could be understood if reading as a standalone however there is character development carried over from book to book. Each book changes the point of view during the read but with the big focus on Zak Waller who has been working as a dispatcher for the Sheriff’s Office of Lost Trail, Montana. After solving two huge cases in the previous two books Zak has now earned a badge along with his dispatcher duties. Bitter End brings the return of Willow McTavish to Lost Trail when she finds that Justin has been diagnosed with cancer. Willow had married Justin to give her young daughter a father but shortly after the adoption papers were signed Willow had run off again with the girls father. Now she thinks she’s going to sweep in and take her daughter back but before that happens her body is found and Zak now needs to find her murderer with both men in Willow’s life being strong suspects. Again I found myself amazed at what C.J. Carmichael can accomplish with a story in such a short time. These books aren’t incredibly long but so much gets packed into each story and never once do I feel like the details are forgotten or the mystery is too rushed. Everything in the book is woven together wonderfully to keep a reader guessing through each turn of the page and the characters have more depth to them than some 500+ page reads. Such a great mystery series with a wonderful small town setting. USA Today Bestselling author C. J. Carmichael has written over 50 novels, with more than three million copies in print. Three of her novels have been nominated for the Romance Writers of America RITA Award, including A Bramble House Christmas. A film version of A Bramble House Christmas is premiering as a Hallmark Holiday movie in 2017. A strong supporter of women’s health issues, C.J. recently donated an original romance to the Love & Hope trilogy published by Lachesis Publishing, with benefits supporting Ovarian Cancer Research. Married, with two grown daughters, C.J. divides her time between her home in Calgary, Alberta and the family cottage on Flathead Lake, Montana. To be the first to know about upcoming releases and promotions please sign up for her monthly newsletter. Great review Carrie. I have the first one on my kindle and need to read it to see what I think. You have certainly got me interested in this series. I was quite pleased to see that she donated to Ovarian Cancer research. That is what my mother passed away from. Thanks for sharing that info about the author. Thanks Carla, I think you might enjoy these if you get the chance to try them. I’ve also read some of her romance and liked those too. That was why I requested them because I have enjoyed her romance books that I read. She’s definitely one that can write a great novella and not make me complain about what they are missing.